Having Bad Reactions to B12 Supplements? - I Can't Eat What? These are also some of the same symptoms of low B12, only they were worse after taking the supplements. The Global Healing Center states that Vitamin B12 is involved in the metabolism of every cell in the human body. It plays a key role in DNA synthesis and formation, red blood cell creation, and brain function. The human body does not create vitamin B12 on its own, so it must be consumed from the diet. However, some people have trouble absorbing B12. There was my answer, but how to remedy this problem? You can also get vitamin B12 deficiency if you’re a vegan (meaning you don’t eat any animal products, including meat, milk, cheese, and eggs) or a vegetarian who doesn’t eat enough eggs or dairy products to meet your vitamin B12 needs. So, I continued to try many different forms of B12: liquids, sublinguals and pills. All of them gave me the same reaction. I was only taking about 2-6 mcg, instead of the recommended 1000mcg! The doctors had no idea how to help me with this. All three of them were stumped! But the fact remained, I needed to get B12 into my body, and fast! Again, I went to the internet. My prayer was that I could find a B12 supplement that had a tiny dose. In my search I ran across a B Complex that contained something called Intrinsic Factor. Since I had no idea what that was, I began researching what it was for. I’m thrilled to say it was the answer to my madness! Intrinsic factor (IF), also known as gastric intrinsic factor (GIF), is a glycoprotein produced by the parietal cells of the stomach. It is necessary for the absorption of vitamin B12 (cobalamin) later on in the small intestine. Some people do not make enough intrinsic factor or have a condition that destroys it. If your body does not make enough intrinsic factor, you can develop a type of vitamin B12 deficiency called pernicious anemia. I have only found a few products containing intrinsic factor so I decided to try the one with the fewest ingredients. The one I chose, and still use, is from Douglas Laboratories and it’s called B Complex with Metafolin and Intrinsic Factor. I’m happy to report that as soon as I tried it none of those symptoms bothered me. Not one of them! And it contains 500 mcg of methyB12! But, I hadn’t reached the mark of 1000 mcg a day, so I had to try to get the other 500 mcg. Most doctors recommend methylB12 so I got a sublingual in that form and tried it. All the brands that I tried gave me diarrhea within 20 minutes! Ugh! Not again! More research led me to learn about the different forms of B12. There are several and the one that works wondrously for someone like me is called HydroxyB12. It’s a form of b12 that doesn’t need intrinsic factor for absorption. I use 500 mcg successfully in sublingual form. It’s hard to find so I recommend this one from Seeking Health. 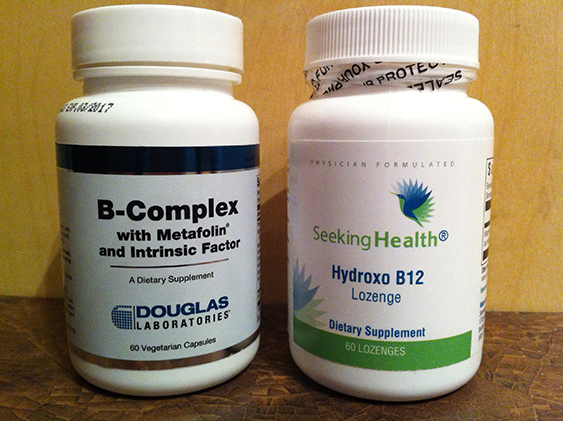 If your blood work shows low B12 and you’re having trouble absorbing it, ask your doctor about Hydroxy B12. It could change your life, as it did mine. One Response to Having Bad Reactions to B12 Supplements? Hi Adam, I have 10 mutations. I started noticing more energy and better mood within hours of using the HydroxyB12. I tend to react quickly with most supplements, usually within hours. That’s also common with MTHFR in some people. I also notice how things affect my sleep right away, too. When I take 2000mcg of the B12 I don’t sleep as well, but many people do well on that higher dose. As you know, it’s a bit of trial and error until you find the right dose for you. I hope that helps.